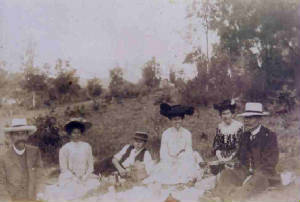 Pictured are (from left to right) an unknown visitor, possibly Francis J Allard, Beryl Allard (Traill), George G W Allard, Muriel Allard, Maria C Woolnough, wife of Horace B Allard (at left). Horace Bately Allard married twice. His first wife was Maria Cowlishaw Woolnough, whom he married in Sydney on the 11th November, 1880. Maria was the daughter of George Woolnough, a Methodist minister, and Maria Cowlishaw. They had 4 children. 1. Muriel Woolnough Allard born 9 August 1869 at ‘Mylwood’, Ashfield in Sydney. She married Archibald Ernest Ramsay on 16 October, 1907 at Burwood, and had 4 children. After the death of Archie in 1924, Muriel took the family to Norfolk Island for just over a year. Here she lived in a boarding house and taught at the Sunday school. Muriel died in 1937 at Bellevue Hill. 2. Beryl Woolnough Allard born 1884 at ‘Mylwood’, was never married. Beryl was known as Billie, and was living with Doris when she died in 1962. Beryl married Mark Alexander Traill on 20 April, 1911, at Burwood. She did not have any children. 3. George Gordon Woolnough Allard born 1889 at ‘Mylwood’, married Viara Floyd Metcalfe in 1916 in Sydney. They did not have any children. Known as Gordon, he worked for and became a partner at Allard, Way and Hardie. Gordon served in the First World War. Gordon died in 1940. 4. Doris Mary Allard born 1892 at ‘Mylwood’. Doris was known as Dolly, and was never married. At the age of 72 she bought her first racehorse, and was featured frequently in the racing pages of newspapers of the time. She died in 1980, at Burwood. Go to the photos page to see some of the newspaper articles. 1. Phyllis Betty, known as Betty, born 14th September 1910. Betty married Frank Varley Sellers and had twins. She died in 1990. 2. Nancy Bately, born 7 May 1912. Nancy married first Robert Henville Simonds, and had 2 children. She then married Nicholas Robert Balfour with whom she lived in England, and had 4 children. Nancy died on 18 January, 2004.